Recent stories in the Pawtucket Times and Cranston Herald indicate that support is building in Rhode Island for public transportation (at least the kind that runs on steel wheels). The Pawtucket Times article written by Donna Kenny Kirwan, looks at efforts by the Pawtucket Foundation and others to make sweeping improvements across downtown Pawtucket, hinging on improvements to the intermodal transit system. Making sense of the city’s labyrinth of one way streets, completing the Blackstone River Bikeway through the city, and building a new commuter rail station between the Conant Street and Dexter Street bridges. The article in the P-Times while at times wildly optimistic, is a worthy read to see the vision for what the future can hold for the Bucket. Meanwhile, down in Cranston, Mayor Allan Fung is keen on having a train station built in the Wellington area to anchor mixed use redevelopment on the east side of the city. As leadership at the state level (especially in the Governor’s Office) lags on getting on board with transit, it is encouraging to see this support on the local level (the Providence mayor is also quietly pushing for streetcars in the capital city). Both Pawtucket and Cranston see the MBTA coming through their cities (MBTA to T.F. Green will run through Wellington) and are envisioning laying some platforms next to those tracks and getting the trains to stop. This is certainly doable, but adding more stops to the MBTA line does present a problem. Every station the train needs to stop at adds more travel time to the overall schedule. As the scheduled trip time gets longer, potential riders become less attracted to the service. Adding interstitial stations along the line to attract more riders and development could have the effect of reducing the number of people using the line further south. One way to offset this is to electrify the MBTA line. The diesel locomotives that the T currently operate are heavy and heavy trains take longer to stop and longer to get back up to cruising speed. Electric trains are lighter and more nimble when it comes to stopping and starting back up. The time savings are slim at each station, but when all station stops are added together the time savings can be substantial. There are of course problems with this as well. As discussed in the previous post, the MBTA is already operating nearly every type of surface transportation system known to man and this multitude of modes is contributing to problems with the agency’s bottom line. The cantenary exists on the Providence commuter line, eliminating one expense of electrification (though getting Amtrak to give the T access to it is a whole other problem). Introducing electric locomotives to the MBTA fleet though will create the need for a whole new team of mechanics, training for conductors, maintenance facilities, etc. 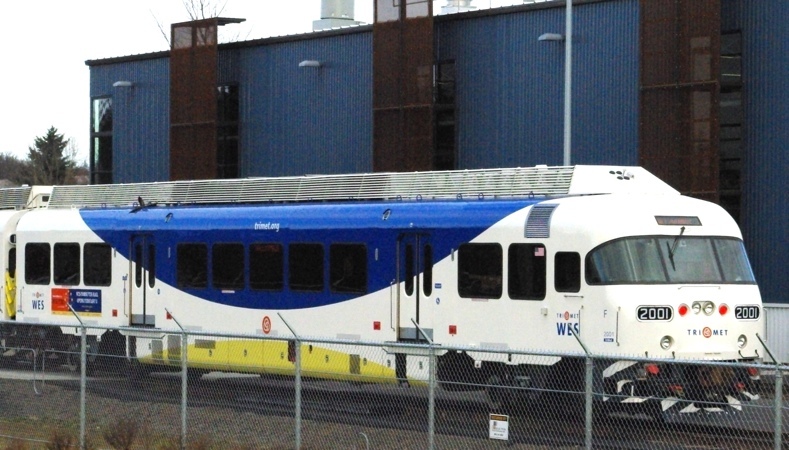 With the T’s current financial difficulties, it is pretty much impossible to imagine that they will invest in electric locomotives anytime soon. When/if the Worcester line is electrified to serve highspeed rail, then the T would perhaps look at upgrading it’s two busiest commuter rail routes. Just because the MBTA is operating on this line, doesn’t mean that the MBTA is the service that will or should provide services for Pawtucket and Cranston. Today Cranston and Pawtucket are the communities eager to get stations; providing a truly robust transportation system would mean us having even more stations along the MBTA alignment, and services in areas where the MBTA alignment does not reach. Woonsocket and Quonset Point are left out in the cold when it comes to rail if the only place we’re going to have passenger service is along the Northeast Corridor tracks. At some point, in order to provide the highest level of service needed, Rhode Island is going to have to look beyond the MBTA for it’s rail transit needs. So what could Rhode Island’s rail system look like? This Rhode Island service could be run with locomotives such as the MBTA has, but we’ve already discussed the drawback of the heavy trains. The service would also want to be more nimble in the number of passenger cars run, a large diesel locomotive pulling two passenger cars is a poor use of the energy needed to operate the locomotive. A system that could work for this Rhode Island service is a DMU. DMU stands for Diesel Multiple Unit. In a DMU system, each car has a diesel engine powering it, not one locomotive pulling multiple passenger cars. This allows for the service level to be scaled as needed. A train composed of DMU cars scales well as it allows extra passenger capacity to be added at the same time as motive power. It also permits passenger capacity to be matched to demand, and for trains to be split and joined en-route. It is not necessary to match the power available to the size and weight of the train – each unit is capable of moving itself, so as units are added, the power available to move the train increases by the necessary amount. There is such a thing as an EMU (Electric Multiple Unit), but as the lines to Woonsocket and Quonset are not electrified, we wouldn’t be using those. New Jersey’s River LINE provides a good model for the service we could have in Rhode Island. The River LINE provides 15-minute headways at peak with DMU trains operating on a mostly single track alignment (added sidings could improve the frequency of service). The route is currently 34 miles long with 20 stations (the Rhode Island system proposed above is approximately 36 miles with 15 stations). A drawback to the system New Jersey is running is that the vehicles they operate are considered ‘light rail’ by the Federal Railroad Administration meaning that the River LINE cars cannot comingle with frieght traffic. This forces what is known as a ‘temporal separation’ with River LINE cars prohibited from operating during evening hours when freight trains are using the line. 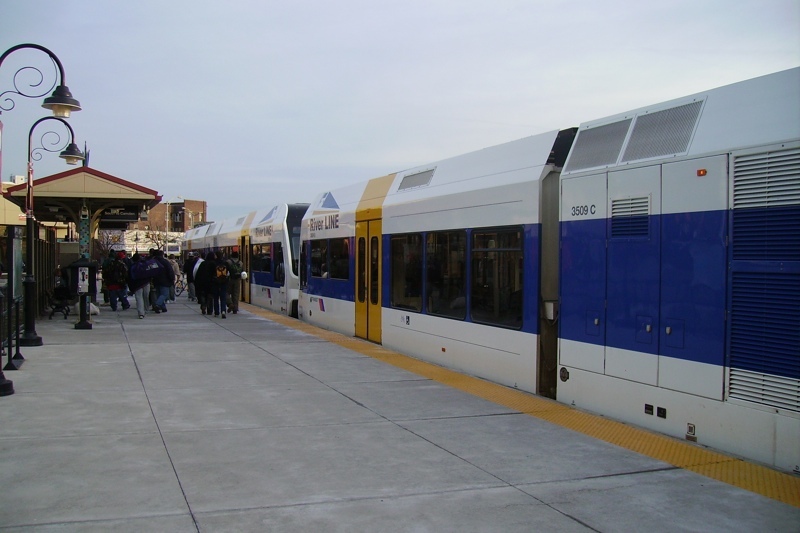 The light rail DMU’s were chosen because part of the line in Trenton runs on city streets. DMU’s in Rhode Island would not need to run in city streets, meaning that heavy rail vehicles could be used commingled with freight trains (as the MBTA and Amtrak services are currently commingled with Providence & Worcester freight). These federal regulations have stymied the development of DMU systems in the US. In other countries where regulations are not as strict, DMU’s are a popular mode of intercity rail service. In the US FRA compliant DMU’s operate on South Florida’s Tri-Rail system where double decker DMU cars are in operation. In Portland, OR TriMet runs DMU’s on it’s suburban Westside Express Service. A rail line running north-to-south through our urban corridor at headways around about 15 minutes would vastly improve mobility throughout the metro area. People north of Providence would have reliable service to jobs in Providence, Warwick, and Quonset Point, frequent service to the airport, direct connection to possible ferry service at Quonset Point. Visitors to Rhode Island could board a frequently running train at T.F. Green and zoom in to Providence or down to Quonset to hop a ferry to Newport, Block Island, or the Vineyard. A system like this is much more nimble than Commuter Rail, allowing multiple station stops within Providence and other parts of the metro area. This system would serve as the spine of Rhode Island’s public transportation system, with bus services feeding into train stations and transit oriented developments springing up around station bringing more housing and more jobs. Of course it is no secret that Rhode Island is in dire financial straits, and the idea of launching our own rail system might seem almost laughable. Hopefully, our financial system will not remain so grim forever, and while we have a much more transit friendly administration in Washington, now is the time when we should be planning for future transportation improvements such as a rail system like this. The streetcar financing is moving along from what I hear. It has to happen. We cannot increase the volume on I-95 without very expensive modifications. And the Transit 2020 report does in fact mention LRT. BTW, I don’t know if you noticed but freight rail is being shifted in RI to a third track. It stretches pretty much from the MA border through to Cranston right now. – Extend the commuter rail south to Westerly. Connecticut has already expressed an interest in extending the NYC commuter rail to Westerly if RI extended trains that far south. This would provide continuous commuter rail service from the NH/MA border through NJ and the PA/Delaware borders which would provide far more public transit access to small towns that currently require car trips. – Get commitments from local/regional governments to provide local bus service to and from the rail stops. In fact, I’d go as far as to say that communities should not get a stop unless they make this commitment (using some form of matching state and federal funds, of course). Again, Connecticut has taken the lead with providing bus service to Mystic from Pawcatuk/Westerly in the past few months. – I’d love to see passenger fast ferry service from either Providence or Quonset Point (or both) to Manhattan. The water passage would be popular in the summer months, and it would be a huge time-saver over auto travel (plus some competition to AMTRAK to lower the ridiculously high fares on this route). If we’re really dreaming about this, Westerly should be included. I know someone who is currently working in Westerly, but was recently in an accident and couldn’t drive for a while. He had been taking the bus to the train station and Amtrak to Westerly. I’m sure he would’ve preferred a commuter rail, which would likely have lower fares. @Ken: I don’t think the CT train to Westerly is Metro-North, but rather Shoreline East, the CT commuter rail that currently goes from New London (maybe even further east now) through New Haven, and I think ends at Bridgeport. It overlaps with Metro-North in New Haven, Milford, and Bridgeport. Also, how long would it take a fast-ferry to get from Quonset to Manhattan? Sounds like that’d be almost as expensive as Amtrak, considering the fast ferry to Block Island from Pt. Judith is something like $36 round trip for a half hour ride. OMG, I freakin love that map! I couldn’t have said any of this better myself. The map is exactly what I’ve envisioned for a comprehensive DMU + Commuter rail core line through RI. Any way to add these 2 other lines to that map as the “future phase” version?? I guess Keep-Eddy-Moving was always intended to be temporary but complementary measures like transit incentives will probably be key in upping transit use in RI; Discounts to RI hospital employees, people who work downtown etc etc let’s get it poppin! Re Keep-Eddy-Moving, it would be good to see an extension of the university pass program to large employers (state government, hospitals, etc.). I’d be interested in seeing how many employees would choose transit over cars if they (1) had their transit prepaid by employers (by simply using their work IDs as a bus pass as students can do) and (2) had to pay for parking. Yes, I think that 3rd track actually runs all the way to the Quonset split. It was made to allow for double decker freight cars to be able to run from Quonset to Boston. At some points the 3rd track drops lower than the other two at underpasses to allow for this. I’m thinking, that if we were to have this type of high frequency service along the Northeast Corridor tracks, it would have to run on that frieght track. Amtrak I think would be unlikely to want slower trains clogging up their highspeed tracks. Plus, P&W has made noises that they would like to maybe someday provide passenger service to Woonsocket, so if they were the operator, they would use their own trackage. When I think in my head of the ideal rail service for RI Westerly is indeed part of it. The map in this post is only the beginning of a service we should eventually enjoy. The problem is, which provider should be running to Westerly. Does the T go all the way down there? Does Shoreline East come north through Westerly? And if so, how far north, T.F. Green, PVD, Pawtucket? Your ferry idea is interesting. Just looking at a map (not taking the time to actually do the measurements) the distance looks comparable to the Bar Harbor, ME to Yarmouth, NS Cat Ferry. That ferry makes the run in about 3 hours (the Portland to Yarmouth trip, which is further is 5.5 hours). The one way fare is $69.00, Amtrak appears to be a little cheaper, and at 3h 40m, about the same time, if you add in the time to get from Quonset to PVD. A New York to Newport ferry may be an interesting proposition though. Keep the ideas coming, I love making maps! Do not get me wrong – I’m liking the map. One question: What’s the justification for a commuter rail stop in Olneyville? A long-term dream of mine has been a trolley line down valley street that passes through to Olneyville and could do any number of things from there. Commuter rail is too (how do i say?) heavy for the neighborhoods within the city. No? Plus, valley has tons of lots that look ripe for development. Who needs all that surface parking when your employees take the trolley? But now I’m dreaming.. I want to see the rest of the colleges in the city charge for parking. I work at PC and parking here is tight. They just started charging students to park this year. It’s something like $200 per year for parking, which I think is fair (though students were in an uproar). I have a feeling, however, that if you got your parents to complain or know enough people, you weren’t paying to park, which is probably the majority of the students. I would LOVE to see the college charge employees to park. While free parking is a perk, they don’t guarantee you a spot. I don’t have a problem with that, but I do have a problem with the fact that faculty and staff routinely drive around campus. It’s a small campus. Because they all have their cars here, they drive to their classes (some only halfway across campus). It’s really a shame. I work in a building that is lucky enough to have a parking lot in front. My department is the only one in this building, with about 25 people, all of whom drive here, many with an 30-60 min commute. They’d still drive. I’d probably give up my parking pass and walk or bike regularly if I had to pay for parking. The problem is the faculty would be all up in arms over having to pay to park. But the fact is, if they had to pay to park and the college extended UPass to the staff and faculty, fewer people would drive here. @T I agree on the Olneyville stop. I think it’s unnecessary. If RIPTA’s system were redesigned, I’d see a small hub at Olneyville Square with buses that would go downtown and to the Reservoir train station. I look at cities of similar size like New Haven or Bridgeport. New Haven has 2 train stations, one at State St, which is newer, to allow for easier access downtown for those riding Shoreline East, and one at Union Station, the main intermodal station, and the end of the line for Metro-North. Bridgeport only has a single train station. The Olneyville station could be added at a much later phase where the old Pascoag-Providence line gets used to provide DMU-type service to the NW of the city. In the shorter-term, we could probably go without it. The Washington Secondary actually branches off from the NE corridor just south of where the Olneyville Station is on that map. The 3rd track ends just north of Apponaug and doesn’t reappear until just north of the Quonset branch. Keep in mind that AMTRAK is a deal breaker in terms of having any of this stuff on the 2 “main” tracks – so infrastructure is a big issue south of the airport. I do think the Woonsocket to Quonset line is immensely important to the future system’s strength. Due to the nearly completed IWAY construction project the Rhode Island Public Transit Authority’s “Keep Eddy Moving!” 50 % off bus fares program has officially ended. Nearly 3000 commuters and many employers participated in this highly successful campaign to reduce traffic congestion and pollution during this major highway relocation project. For employers who are interested in continuing to offer subsidized transit for employees, RIPTA has begun a program called EcoPass. Similar to our highly successful UPASS program for colleges and universities, this smart card allows employers to subsidize transit per ride, eliminating the need to distribute monthly fare products and encouraging transit usage among occasional riders. Employers pay a reduced fare, distribute as many cards as they want, and pay only for the rides taken. The Olneyville stop is not a commuter rail stop, it is only a stop on the Woonsocket-Quonset line. The only commuter rail stops on this proposal are Wickford Jct., T.F. Green, Providence, Pawtucket, South Attleboro. The Woonsocket-Quonset Line (RIrail as I call it in my head), is set up as a more rapid transit type line, 15 minute headways as opposed to a commuter rail line, which has headways at the rush hours catered to commuting patterns. So between Pawtucket and the airport, people would use the line as a subway line, travel on demand through the metro area. Actually, I left out some stations that probably should exist, RWP Zoo, Brewery Parkade, Promenade, Charles Street, Branch Ave… As this is to run as rapid transit, stations can and should be closer together in the urban core than the commuter rail stations are. I would indeed like to see a street car line along Broadway to O’ville with an extension west to Route 295 in Johnston. Street running until O’ville, then in the Route 6 median to the west with Transit Oriented Development in Johnston. The station at O’ville becomes a major hub for buses coming in from the west and allows for transfers from O’ville to the train for service to jobs and other residential areas north and south along the line. Example, someone living in Silver Lake takes a bus to O’ville, switches to the train and heads to their job on Jefferson Blvd. or at Quonset Point without having to go all the way into Downtown Providence. What T says about the Olneyville stop applies to the Smithfield Ave station as well. A streetcar version of the #99 will do a lot more good. Jim’s tale of drivers to PC illustrates perfectly how little a line like the one proposed above might accomplish in the absence of vastly improved local connections. No one now driving from Warwick or Lincoln to PC will take the new commuter rail if the last mile or two is still a slow bus that comes every hour. A recurring problem in transit planning is how a temptingly ready to build project like an RIrail “subway” is simply is not close enough to enough busy places to actually function as a subway. A real subway, the stairs would come up right at Turks Head, right into the Mall, Rhode Island Hospital, Thayer and Angell, the Zoo entrance, etc. If we are not about to get digging, we better look at surface transit that goes within steps of where businesses and residences already are. A station like the one at Smithfield Ave would be long dreary walk from anywhere worth going. RIrail is worth doing and many of its stops will be great TOD sites, like Brewery Parkade, but the greatest existing transit needs will still need to be served some other way. I couldn’t find any information about EcoPass on the RIPTA website. I’d love to forward any information to my employer. Many people at my office depend on RIPTA. It would be neat if we were rewarded for using it to commute. I think the EcoPass program is still in development and has not been officially rolled out yet. I think they are scrambling a bit to move the Keep Eddy Moving people over to EcoPass while still working to roll out EcoPass. I’d recommend contacting RIPTA for more info. Long ago on a computer far, far away, I used G-Earth to map existing and dis-used rail line to create a Narraganset Bay loop that basically connects Prov with Newport. (That computer got water spilled on it, so no graphic available.) A loop like that, running in both directions, would take in the whole East Bay which has been entirely left out of this discussion. Rail nodes would create TOD opportunities in all those communities, too. I hear what you’re saying regarding having the transit where the people are/want to be. This type of system would have to evolve over time, and this RIrail idea is only part of what we need to be doing to move people about the metro area. The first benefit of this system would be bringing people in from the suburbs via transit, making them transit converts. The biggest movements would probably be to Providence Station. Once these transit converts are in the city we’ll need robust transit to get them to their destinations in the city. Streetcars will be part of that, but I also envision some sort of circulator system as I talked about here. Making suburbanites transit converts means that we have people outside the city who view transit as more than just a welfare system. We build political support throughout the state to provide better service within Providence. It is very chicken and egg of course. We need to have a breakthrough to get these converts and start the ball rolling. If a system like this were to be built, we’d have to study station location carefully. Smithfield Ave. is very likely not a candidate for the first round of stations. Let local transit build up on North Main, let development respond to that increased transit, then eventually we’ll reach a point where it makes sense to have Smithfield Ave. get a RIrail station to supplement the Streetcar or BRT or whatever we end up with on North Main Street. In Cranston, we see Mayor Fung approaching it from the other end, let’s build the station now to spur development later. The former or latter strategy will be best for different station locations. Knowing where that third track ends is valuable. Without doubt, to make this viable, the third track will need to go all the way to Quonset. Indeed, there is no way Amtrak would allow a service like this to operate on it’s tracks, and I don’t think they are wrong with that. We don’t want to have high speed rail suffer at the expense of local service. We have tracks from Pawtucket to Woonsocket, a third track from Pawtucket to Apponaug, only needing to build that third track from Apponaug to Quonset puts us a long way towards having a system like this. Trackage is expensive, having so much of the needed trackage in place is a wonderful resource we should be exploiting. The trackage investment is significant since the missing section of the 3rd track is along the water (think of the never ending EPA/DEM hurdles, studies, and costs) through Warwick and EG. Every bridge crossing would need to be widened as well. I would guess thats why the State didn’t add the 3rd track for the P&W FRIP to begin with – BIG dollars just for the 3rd track. I’d also like to point out that the proposed Cranston station at Wellington is right at the junction of where the Pontiac Secondary and Warwick Industrial tracks branch away from the NEC. This would bode well for the east-west DMU service to feed the commuter rail at that station. Since CR is already coming and has Amtrak “approval” south of the airport, I’d say that Quonset could be a candidate for a ‘branch’ of the CR and the DMU service could be Woonsocket to Coventry via Providence. Phase 1 could simply be Woonsocket to Providence where you could connect to the MBTA to Warwick, Wickford (and then Cranston, etc. when added). Lastly, while the CR is a great start, DMU type service is really what is needed between the airport the city to get full utility and demand. Mental757, you’re right about why the FRIP didn’t continue the third track through EG. There are (I think) four bridges in the area, including one from the 1800s. They also would have had to tear down at least one building in the EG Historic District. RIDOT told us that they decided it wasn’t worth the hassle at the time. That said, RIDOT is either about to start or already has begun a feasibility study for an EG commuter rail platform, which would have to include a third track for making stops, so we should have some official info on this in 2 years. To be sure, Jef, you have “track” from Pawtucket to Woonsocket. Singular. Single-lines are a difficult problem. One of my clients is directly on Metro North’s Norwalk/Danbury spur that parallels Rt 7 (which is its own unique transit nightmare). The spur’s performance is sub-optimal at best. Basically, trains go one way in the morning and the other way at night. Which was great 30 years ago when Norwalk, Wilton, etc. were all commuter towns. Today, Rt 7 hosts tens of thousands of workers in an ever-growing sprawl. And they all have to take cars because the trains are running in the wrong direction. That’s not the only thing wrong with that spur by a long shot, but the sparse scheduling doesn’t help. I also think that any service off the NEC/I-95 axis will be challenged by the scale of the ridership. I have a hard time seeing rail cars filled along these lines. Finally, can’t we dream this out, like really dream? Why do we need hundreds of tons of steel to move people these relatively short distances? It’s ridiculously expensive in engineering, building, labor, etc, etc, etc. And it makes us all beholding to those ****s, the AAR. I personally feel that the uber-RIrail project needs a healthy dose of technology transfer outta RICIE or whomever to get some radical new technologies and materials applied to this thing. Think smaller pods, super-light, super-strong, runs in both directions on a single, elevated rail. Crazy talk, right? For my money, putting new heavy steel on AAR properties is asking for problems. Bil, there looks to be ample room to add a spur at the EG site (which is just south of the historic EG ‘dowtown’). The 3rd line starts just north of the Frenchtown/Post Rd intersection (just N of the bridge where Rt. 1 goes over the tracks) and continues to Quonset junction. There is also an old parallel spur (3rd track) just south of the Rocky Hallow Road bridge, which I think is where they are looking to put the EG platform. It must be less than a mile gap between these 2 points where a 3rd track could be added (some wetlands though). So the amount of missing 3rd track isn’t quite as bad as I thought. From Apponaug to EG and then a small gap south of EG to Quonset. Unless I am mistaken, RIDOT is nowhere near actually beginning some sort of feasibility analysis for an EG train station. There have been one or two meetings between the DOT, town planners and residents to get a sense of how the train station idea is being received in EG; seems pretty mixed right now. It’s pretty much in the Town’s hands right now. A RI-rail line is the only realistic way to get Rhode Islanders out of their cars and use transit on a mass scale. The statistic that Rhode Island is #12 for single-occupancy car use for commuting is an embarrassment. The smallest state that is the second most densely populated in the country should be #50 for single-occupancy car use, not #12. Extending MBTA or Shoreline East trains with few and distant stations alone simply won’t cut it. The notion that the MBTA extension to TF Green would serve air travelers with hourly or half-hour headways scheduled primarily during rush-hours is dubious at best. Streetcars and light-rail proposals are great for the city or inner-ring cities and suburbs for shorter trips. But commuting on a streetcar on city streets in traffic more than four or five miles would be slow and torturous|-people would simply drive instead. A single RI-rail “subway” line could unify the entire transit region. Downtown Providence is no longer the only major business center in the metro area. There are many, most of which, fortunately, are adjacent to existing active rail lines, or inactive rail rights-of-way. The Woonsocket to Quonset rail corridor is roughly 37 miles. RI-rail line stations could be fed by a reorganized bus system that could funnel passenger’s short distances to stations. Providing parking facilities, especially in suburban areas would encourage ridership. There’s well over a half a million people within 5 to 10 minutes of the Woonsocket to Quonset corridor and most of the state’s employment districts. Proposing a RI-rail line shouldn’t be about “dreaming,” but of rallying and building consensus throughout the metro area and state. This is about building political will. The state and cities may be broke, but if everyone is on board with developing a transit system that works, the money will be found. the last update I got from RIDOT is that they are hiring a consultant to run the numbers for all the phase 2 sites (Westerly, Kingston, EG and Cranston). When they spoke to us earlier this year, they said they hoped to have the process started by the summer, but as of September they were running behind on that timeline. Peter, you should run for governor! I couldn’t agree more with your assessment on RI transit. There was a meeting today in Northern RI about rail service. If I can get some more details about the meeting, I’ll post them here. What I do know is, it was a very pro-rail meeting with people/organizations in attendance that can actually do something about moving rail forward. As with everything around here, it all comes down to money and where we can find some. Over 100 statewide leaders from congressional delegation, state legislation, cities, RIDOT, RIPTA, and business communiity attended our meeting to discuss transportation in Northern Rhode Island. Very good event. Very good discussion. Let’s keep the momentum going. Join us as we advocate for a 21st century transportation system in Rhode Island with a commuter rail stop in Pawtucket! I keep trying to click Like and keep getting an error, stoopid Faceplace! After printing and reading all 13 pages of this article, as well as looking at the comments about the Woonsocket-Quonset rail line, there is one thing that State of Rhode Island, Rhode Island Department of Transportation (RIDOT) and the Rhode Island Public Transit Authority (RIPTA) should look into and I made this suggestion before to both RIDOT & RIPTA, which is having RIPTA operate its’ own commuter rail line, especially if there are also plans to have a streetcar or light rail system in the Metro-Providence area. First, State of Rhode Island & RIPTA should get RIPTA’s budget in order, before they plan any streetcar, light rail, commuter rail, and/or ferry (better than what was offered this summer, see the articles: Ã¢â‚¬ËœYou can haz RIPTA Ferry! & RIPTA Ferry, FINALLY! and the comments that go with them). In addition to RIPTA’s budget problems, the MBTA is also having their own budget problems as well and may hold off on some of their own transit projects, including the extension of the MBTA Providence Commuter Rail Line to T F Green Airport & North Kingston. If RIPTA has a Streetcar/Light Rail System and its’ own Commuter Rail System, RIPTA should create a special division for its’ Streetcar/Light Rail & Commuter Rail operations called the Rhode Island Public Transit Authority (RIPTA), Rhode Island Rail or Railway Division or RIPTA, RIRail or RIPTA, RIRwy Division. Rhode Island Public Transit Authority (RIPTA), Rhode Island Rail or Railway Division or RIPTA, RIRail or RIPTA, RIRwy Division should also have co-jurisdiction of the MBTA Commuter Rail Line to North Kingston. The MBTA Commuter Rail Line would be called the MBTA-RIPTA Boston-Rhode Island Commuter Rail Line. With other of RIPTA rail lines, they would consist of: Rhode Island Public Transit Authority, Rhode Island Rail or Railway, or RIPTA, RIRail or RIPTA, RIRwy Trans-Metro Light Rail, which would be the proposed streetcar or light rail system in the Metro-Providence area. Rhode Island Public Transit Authority, Rhode Island Rail or Railway or RIPTA, RIRail or RIPTA, RIRwy Trans-Suburban Commuter Rail, which would be the proposed, Woonsocket-Quonset Commuter Rail Line. Then a suggested I made to the Rhode Island Department of Transportation (RIDOT) and the Rhode Island Public Transit Authority (RIPTA), a commuter rail line between Woonsocket & Westerly, that would include part of the Rhode Island Public Transit Authority, Rhode Island Rail or Railway or RIPTA, RIRail or RIPTA, RIRwy Trans- Suburban Commuter Rail (Woonsocket-Quonset Commuter Rail Line), up to Frenchtown Plaza Station, a stop at Wickford Jct on the MBTA-RIPTA Boston-Rhode Island Commuter Rail Line, plus Slocum, West Kingston-University of Rhode Island, Kenyon, Wood River Jct., Bradford & Westerly. Now with the MBTA-RIPTA Boston-Rhode Island Commuter Rail Line should use diesel or electric locomotive, that way the locomotives could use them on the passengers cars that MBTA have now without getting a separate set of rail equipment for the MBTA-RIPTA Boston-Rhode Island Commuter Rail Line, such as the Diesel or Electric Multi-Units (DMUs or EMUs) railcars on the Rhode Island Public Transit Authority (RIPTA), Rhode Island Rail or Railway Division or RIPTA, RIRail or RIPTA, RIRwy Division Commuter Rail System. With a diesel, the MBTA would be using their GP40 and F40 diesel-electric locomotives like they normally would be using on their entire commuter rail lines. With electric, the MBTA should look into having the Asea Brown Boveri (ABB) ALP-44 Electric Locomotives that is used by both the Southeastern Pennsylvania Transportation Authority (SEPTA) and New Jersey Transit (NJT) en.wikipedia.org/wiki/ABB_ALP-44, or the Bombardier ALP-46 Electric Locomotive, that is New Jersey Transit (NJT) new electric Locomotive http://en.wikipedia.org/wiki/ALP-46. RIPTA now has an Eco Pass page on their website. I’ve still yet to see any discussion of transit options for people farther west of 95, like Foster, western Coventry, Burrillville, etc. There are lots of little mill villages that look like ghost towns but would be more attractive as residential areas if there was easier access to the city or the major shopping areas. Prices in those areas are cheaper than Providence and Pawtucket as well. We also have major employment centers outside of Providence, including West Greenwich (Amtrol, IGT, Amgen), Smithfield (Fidelity), and Woonsocket (CVS). I don’t see how these plans help any of those employees utilize mass transit instead of commuting via car. These rail plans and RIPTA’s current focus seem mostly about getting people in and out of Providence, but there are other areas of the state that are destinations and need economic development help. It’s also possible that we could equalize housing costs a little if living in Providence and working outside of it was equally as feasible the opposite. Regarding propulsion there are and have been self propelled Diesel Cars designed to take less time to slow down and accelerate. Enough, stop posting in every thread, I’m going to start deleting your posts.